What is an Authorized RhinoFabLab? An Authorized RhinoFabLab™ (fabrication laboratory) is a small-scale digital workshop, certified by McNeel, with an array of Rhino and Rhino compatible software and computer controlled tools and training. These tools cover the various leading-edge industrial methods and materials needed to design, analyze, and fabricate almost anything. A RhinoFabLab's primary mission is to share the world's digital fabrication expertise in their local community. Is recognized as a leading-edge provider of industrial grade digital design, analysis, and fabrication expertise. Has all of their events and activities published to a worldwide audience. Has worldwide access to the specialty experts in every aspect of digital design, analysis, and fabrication. Has direct access with many of the digital design, analysis, and fabrication product development teams. 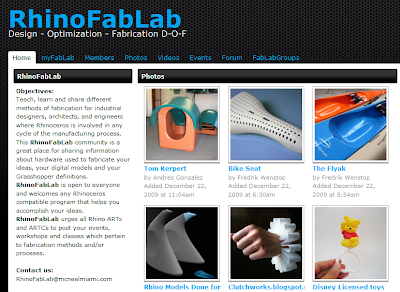 The RhinoFabLab community is a place to share, learn and teach different methods of fabrication for industrial designers, jewelers, architects, and engineers when Rhinoceros is involved in any phase of the design and manufacturing/construction process. It is also a great place to share information about digital fabrication hardware, digital models and Grasshopper definitions. RhinoFabLab is open to everyone and encourages discussions about any Rhino compatible software and hardware that helps you realize your ideas. Andres Gonzalez, in the McNeel Miami office, is your host.